When the rustling dies down and the chatter picks up Lam invites us to throw the planes at him. It’s a delightful start to a charming play. The program notes credit Lam with translating and adapting the piece from the novel by Antoine de Saint-Exupery. It’s been years since I read the book in English or in French but, coincidentally, I have discussed it with friends on a couple of different occasions in the past year. To me this is much more an adaptation than a straight translation. It’s true to the spirit of the book but the language is modern English, there are computers, you can friend people, click to like a streaming DJ; the story has been moved from WWII to the present. Anahita Dehbonehie’s set is spare. A triangular hill that looks like it’s made of paper takes up about half of the back of the stage. In front of it the pilot’s crashed plane looks like a giant paper plane. The costumes are also plain. Both the Pilot (Richard Lam) and the Prince (Kira Hall) wear navy blue jumpsuits and white scarves. It’s very effective, it’s almost as if they’re part of the set. The lighting by Wes Babcock changed the feel of the set so that even though the crashed plane was always on the stage it wasn’t hard to ignore it and believe that we were seeing The Little Prince’s planet rather than a desert on earth. As well as playing the pilot Lam is the narrator and plays all the characters that the Prince meets on his way to earth. His performance changes to match the character he’s playing. Some of them are really one-dimensional, intentionally so. The Pilot is a more well-rounded character and Lam shows the shift from frustration to love in his feelings for the Prince as he gets to know him. The Little Prince is incredibly annoying when he first meets the Pilot and Hall is terrific, demanding a drawing of a sheep. My favourite scene is the Prince taming a fox – a paper puppet fox. The Prince doesn’t know how to do it so the fox has to teach him. I knew the fox was a puppet but I still believed that the Prince was really taming him. It’s lovely. Hall designed and built the puppets. Most of them start out looking like the discarded paper planes on the stage. Remember the paper planes? It’s so clever, having them on the stage and then having the puppets evolve from them, or from something like them. I loved that. Jon Lachlan Stewart’s direction with Richard Lam’s writing has pulled everything together into a play that is fresh and modern but stays true to its roots. 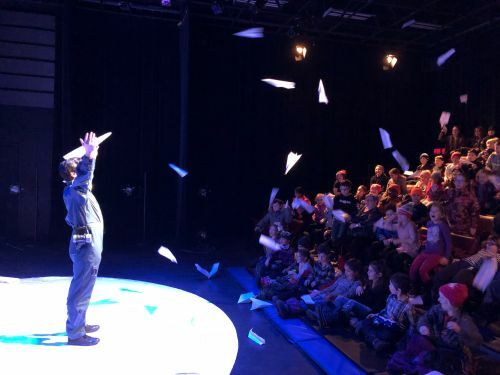 There were a fair number of kids at The Little Prince: Reimagined on Saturday evening and they seemed to enjoy the show. There were also a lot of people without kids and they all seemed to enjoy the show. I certainly enjoyed it. It is a great family show and those aren’t always easy to find.